It's almost irrational how much I love glitter mixes that have little squares. I bought the somewhat HTF OPI I Lily Love You instead of the much cheaper Love & Beauty Pink (swatched but not compared on Lace and Lacquers) simply because the Love & Beauty lacked the all-important tiny squares. They aren't completely obvious in the glorious iridescent frenzy of I Lily Love You, but they're there and they're the best part. When Revlon Heavenly came out, I was giddy. I'd almost bought Deborah Lippmann Stairway To Heaven just a few weeks before, tempted by those squares. My eyebrows obviously went up as I read G.'s post about the new Sally Hansen Open Mica Night. Holo squares! Oooh! 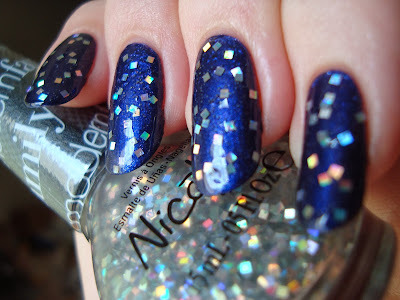 Imagine how startled I was to see a very similar looking glitter topper from Nicole by OPI at CVS that Saturday. I hadn't heard anything about a holiday Modern Family collection at all! They're CVS exclusives and really haven't gotten much attention. I can't even find a promo photo. There are three shimmers and two glitters. The glitters caught my eye, but the shimmers really didn't. I generally love Nicole by OPI, but they've fallen a bit flat for me recently and this batch doesn't really change that. I'm not sure if companies are trying to break a "rut" or what, but a lot of the holiday collections this year don't feel very festive. I'm seeing a lot of softer shades where I was hoping for the usual jewel tones. Money saved, I guess, but...*sigh*... I looked long and hard at all five and still only came home with Spark The Conversation. Spark The Conversation has medium square silver holo glitter in a clear base. I feel a little dishonest posting that photo first, and I'm sorry. I really don't like writing negative reviews, but I have to be brutally honest here. I had a seriously bad time with Spark The Conversation on the first try and you'll see that further down. This stuff is a hassle and getting it to look presentable took way more effort than it should have. It was a real letdown, since their glitters are usually great. 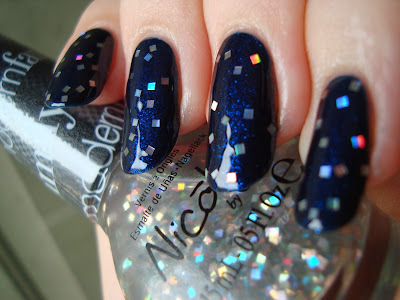 I've come to expect easy, smooth application for OPI's glitters in general, no matter which line they're part of. Spark The Conversation isn't up to that standard at all. The base is watery. The glitter sinks. There flat-out doesn't seem to be enough of it either. I had to swirl the brush to catch enough to bother putting it to the nail. The result is sparse and the glitter floats around as you move the brush, really fighting any attempt to put it where you want it. Even dabbing is awkward and fiddly. As thin as it is, the base still really wants to bubble, almost getting frothy if you dab too much. Trying to let some of the base flow off just made the glitter leave the brush too. I wound up letting the base and glitter dribble off the brush and onto the inside of the bottle's neck, then placing the few glitters left, before going back in to retrieve a few more from inside the neck. 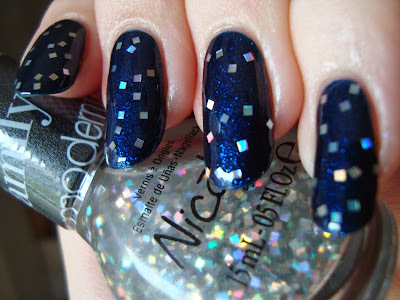 As far as the glitter itself, the holo effect is nice and sharp, because each piece lays completely flat. It's even fairly easy to photograph the little rainbows playing across each piece. They're small enough not to stick up and they don't take much top coat to smooth out. I'm cringing looking at that, are you? So much went wrong. The squares are chaotic and overlap each other, but the base is the real issue. It manages to not have enough of a grip on the glitter in the bottle, but also not want to let go of it on the nail. Bubbles are a serious issue, but what really disturbs me is the weird dent at the tip of my ring finger. I don't even know! Bottom line: Oof. If you're into hand-placed glitter, go for it. If not, you probably don't want to put up the fight it takes to get Spark The Conversation to look good. I'm debating returning this. I might keep it to franken, but the base makes me wonder if that would turn out ok. I'm torn between hoping that Sally Hansen Open Mica Night is better and worrying that it'll be almost the same stuff, since Sally Hansen and OPI have the same parent company and occasionally put out almost identical polishes, especially in Sally Hansen's Complete Salon Manicure line.